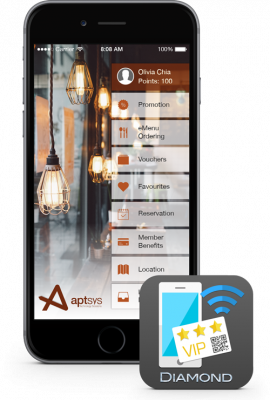 At Aptsys, we not only offer high-end Wireless eMenu Ordering & POS solutions, we have now developed a user-friendly Mobile Ordering & Loyalty App – Diamond that will enable restaurant customers to use their smartphone to order, create their own favorite menu, view loyalty points, past transactions, vouchers, promotions, etc. 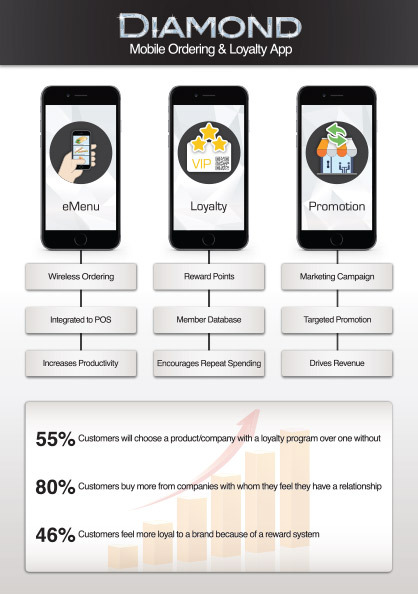 The Mobile Ordering & Loyalty App allows the restaurant owners to do marketing to increase their revenue. 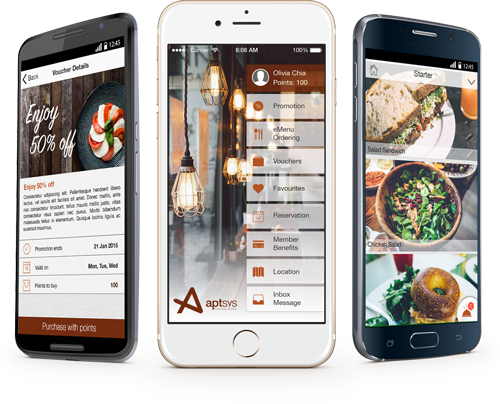 Most importantly, the Mobile Ordering & Loyalty App will entice restaurant customers to keep coming back! Mobile Ordering & Loyalty App is fully integrated with our Jade POS to ensure a seamless end-to-end link from ORDERING -> PRINTING -> PAYMENT. It will help to speed up the restaurant work-flow and increase the restaurant productivity. The Mobile Ordering & Loyalty App also supports multiple loyalty programs, and the restaurants are able to reward their customers with points and discounts to encourage them to return. It is the most effective way to help restaurants build a relationship with their customers. Restaurants are able to create their own marketing campaigns and send notifications of promotions, special offers, and vouchers to their targeted customers. Wireless ordering via mobile app, fully integrated with our powerful POS and kitchen printer. Attracts & retains more customers & increases the repeat customer percentage. Preset a marketing schedule to send SMS or Email to targeted members in order to build stronger relationship with them.